Four intelligent pitch effects in a stompbox! 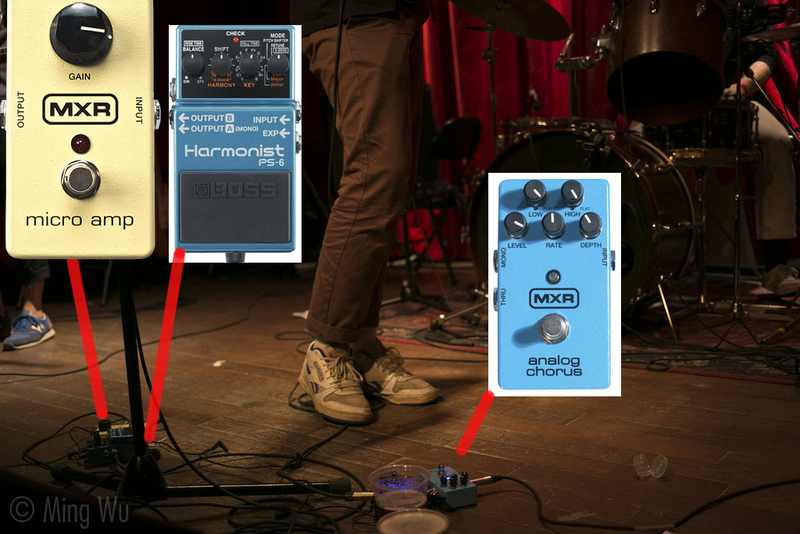 The blue pedal in the pedalboard picture. In the video by Guitar World, Jason Hook goes into great detail about his signature Gibson Explorer guitar and how he has built in the Boss Pitch Shifter in to the guitar. Visible at 17:53 of this "Rig Rundown" is a Boss PS-6 Harmonist Pitch Shifter Guitar Effects Pedal. Jason's guitar tech mentions that they don't usually use this effect, but keep it as a back up. In this video in Portuguese, Andreas gives a rundown of the rig he's using for the Machine Messiah Tour 2017. The Boss PS-6 Harmonist can be seen 6:50 into the video. In the gearbox section in the end. at the upper right of the picture, the Boss PS6 can be seen. In his pedalboard on this instagram post "JUSTICE!!! Thank you to the LAPD, TMZ, And every person who helped track down the human garbage who stole all our gear!" 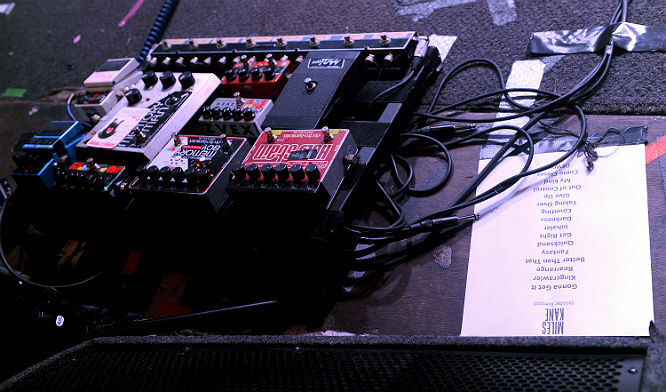 A photo of Brendon Small's pedalboard which he posted to Twitter shows he uses the Boss PS-6 Harmonist Pitch Shifter Guitar Effects Pedal (lower right of the board). He captioned the photo, "Fired up the ol' Dethklok pedal board for @FestivalSupreme sounds real clean @Roland_US @jimdunlopusa @RiveraAmps " (posted Oct 2014). This pedal is seen in the video, Weikath use the same gear in the video. At around 0:57 he shows the Boss Harmonist pedal. Gillard starts his pedal chain by running straight into a TC Electronic PolyTune tuner. From there, in order of signal flow, the sound hits a Voodoo Lab Sparkle Drive Mod, an original Landgraff Dynamic Overdrive, a pair of Boss GE-7 Equalizers, TC Electronic Corona Mini Chorus, Boss PS-6 Harmonist, and an Electro-Harmonix Holy Grail Neo. The whole board is powered with a Voodoo Lab Pedal Power 2+. At 2:50 in this video, one can clearly see Josh Scogin use his Boss PS-6. 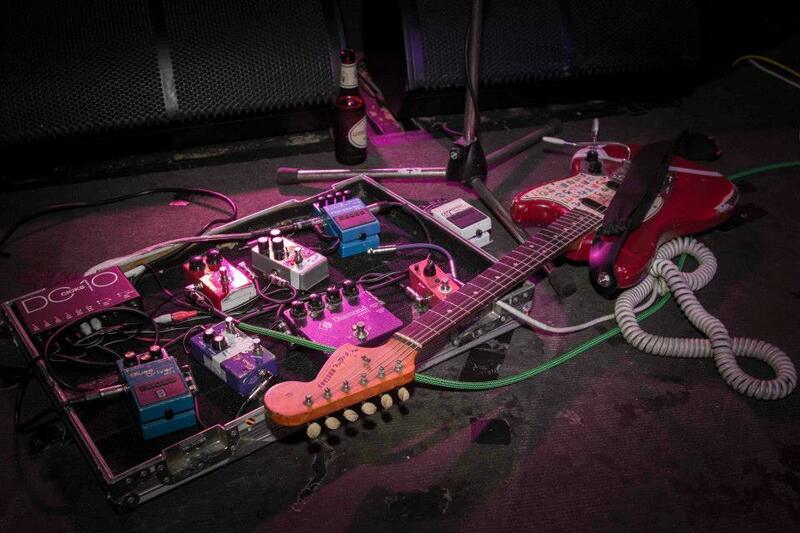 At 2:55, there is an awesome shot of Colin frangicetto' pedal board. Take a look at the top row, in the middle you can see the Boss PS-6 Harmonist pedal. Colin says "I’d use like a couple pedals from Boss where I’d combine a harmonist Pedal with a [super octave](http://equipboard.com/items/boss-oc-3-super-octave-pedal). Which is basically taking - which means I can play a lead part but it would drop the part down a few octaves and then on the harmonist I could do, put like a harmony on it so it almost sounded like two guitars at the same time." In this Instagram photo shared on Ekstrom's account, the Boss PS-6 harmonist can be seen. In a gear tour done for Breaking Benjamin's site shallowbay.com, guitar-tech Hoogie mentions the pitch shifter at around 1:03 into the video commenting "...like you'll hear in Diary Of Jane [...] and Dance With The Devil". At 8:24 in this video, is a shot of Mike Kerr's pedal board, containing a Boss PS-6 Harmonist Pitch Shifter Guitar Effects Pedal. At 3:01 in this [video](http:///www.youtube.com/watch?v=0X6C4sqU1f8) Mike says "I kinda fell in love with the Harmonist pedal. The thing that really turned me on actually were all the kind of dive bomb settings it had, because I had loads of amps running at the same time; I worked out I could start divemombing one amp against another so I ended up buyng three. So I've got three on the board. In this Instagram picture, Harry shows us his pedalboard and clearly seen is the Boss PS-6 Harmonist in the centre; used on tracks such as Wraith. Can see the Boss Harmonist from The Japanese House's gig at Dingwalls, Camden on 26/2/16. In the bottom left he is seen using an Harmonist PS pedal. It's the one in the picture posted by Awsten himself. at the shot of Mikey's pedalboard at 0:32, a Boss PS 6 can be seen. "I also used a TC Electronic Flashback pedal and Hall of Fame reverb, a Boss DD-7 digital delay, and a Boss PS-6 pitch shifter"
In Pedals Fusion's 2015 interview with Atsuko Chiba, Kevin showed off his pedalboard, which included a Boss PS-6. In Pedals Fusion's 2015 interview with Atsuko Chiba, Karim showed off his pedalboard, which included a Boss PS-6. Found in her Roselia pedalboard that was posted on her Twitter account (second image). On one of the photo's of Lee Kiernan's rig, posted by official Marshall page, Boss PS-6 can be seen. At 1:15 in the Video, Chris goes through his Vocal Rig and Demonstrates using the Harmonist in his vocal chain for pitch shifting effects during his live sets. Meet the BOSS PS-6 Harmonist effects pedal, with four intelligent pitch-shift effects and three-voice harmony in one convenient unit. Among the effect modes are Harmony, Pitch Shifter, and Detune, plus the all-new Super Bend for authentic pedal-bending effects and wild 3- and 4-octave pitch sweeps. With the PS-6 Harmonist, you can even control pitch with an optional expression pedal. The Harmony function is fast and simple to use, and supports a variety of interval patterns. It's easy to create rich, 3-voice harmonies: choose a major or minor key, and set the Shift to 3-VOICE-that's it! The PS-6 Harmonist is an unbeatable combination of superior sound quality, ease of use, and powerful pitch effects, all under one hood. The BOSS PS-6 Harmonist is the new-generation pedal for harmony shifting. Sound quality has been improved dramatically thanks to its powerful DSP. With the PS-6, you can render complex harmony voicings beautifully, naturally, and easily. The PS-6 Harmonist can generate 2 or 3 voices, such as direct/third/fifth, in each of the following modes: Pitch Shifter, Detune, and Harmony. This will add rich depth to your guitar sound. Detune broadens the sound in a natural way, as the PS-6 allows 3-voice detuning with slightly raised and lowered pitch added to the direct signal. Voices can also be pitch-shifted one octave up and a fifth below your note-great for arpeggio-style playing, for example. This amazing effect bends pitch across a 7-octave span, from -3 to +4 octaves! Set the Rise and Fall time to your taste. You can control the bending effect in real time with the pedal's knob or from an external pedal such as Roland's EV-5 Expression Pedal (sold separately). Manipulate a wide variety of effects using simple operations. In Harmony mode, for example, all you have to do is select the key, specify whether it's major or minor, and use the SHIFT knob to select the voicing you want to use. The Shift knob switches between the different pitch settings available in each mode. BOSS compact pedals are world-famous for their great sound as well as their road-tough construction, consistency, and reliability. The PS-6 inherits this BOSS-proven design, offering guitarists a solidly constructed pedal that's built to withstand decades of demanding use. I really got excited about this pedal (as another reviewer mentioned) once I hit the S-bend function. You can do fast or slow, pitch dives or rises by pushing the pedal down, and if you keep the pedal down you get some really warbly strange effects. I also use this pedal in s-bend mode to split my signal in to two amplifiers. There's so many things this pedal does, you'll find something strange and useful. I generaly use it on guitar, but not only. Sometimes I use with my mic or with my keyboard. It's perfect to study and composition, but his variety of effects is a little complex to use on stage, mainly if you're not playing pop or tonal music. (tonal here is just a opositive to modal music) Use repeatedly the same effect on the same music may sound boring, but i'll find a way to fit it your music. I found the actual pitch shifting functions on the pedal overcomplicated and I couldn't be bothered with them, but once I found the S BEND mode I never turned it off. A pedal that does DIVEBOMBS? sign me up. does it do a detune that's like 10 cents or less? it does have a detune setting, but I've personally never found a reason to use it. However, this is a very high quality pedal so i imagine it's good enough. De los últimos que he adquirido. A falta de otro guitarrista en la banda, bien se pueden crear armonías con este pedal en los momentos donde se ejecutan solos. No sirve para acordes porque tiende a crearse una masa de sonido sin sentido, solo es para punteos, estoy recién conociéndolo pero me ha dado varias buenas sorpresas. It was cool for a little while for me but it was more an impulsive buy. Cool sounds but I rather just play the harmonies myself. The video demonstrates the stabilitiy of the tracking, and a key pedal used in Mike Kerr's rig for Royal Blood. The demonstration here shows the pedal used in 5ths, to create power chords alongside the Electro Harmonix POG2 (which is set up an octave). I got this pedal veary cheap (app. USD$80) and it's great. Good sound, versatile and have 4 choices (Pitch Shifter, Harmonizer, Detune, Super Bend). Is hard to use all the potential that pedal has. For that price (~150 $) you can't really beat it. Of course it is not out-of-the-box pedal, a basic scales knowlegde is required here to get full potential of PS-6; it takes some time to dial into "that perfect tone". Works best in fx loop or after dirt section.